I think the whole idea of the Freedom trail is pretty novel. You can choose to start off in Boston Commons (or anywhere on the way like me), and follow the 3 mile, red brick-lined route, all the way to Bunker Hill in Charlestown. 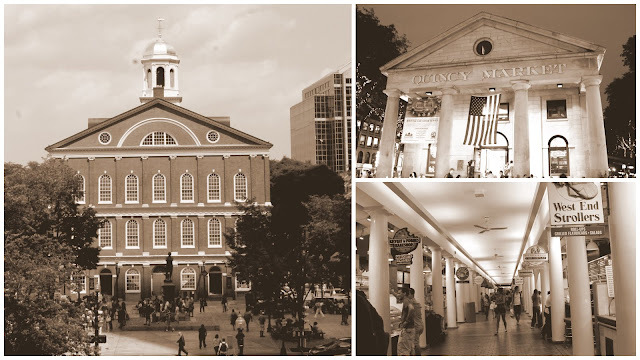 This trail brings you through 16 historical sites and highlights major events in the history before, during and after the American Revolution involving Boston. You must not miss this history lesson while you are there! Maps etc can be downloaded here. Alternatively there is also a smartphone app available. While there are guided tours, I suggest going on your own self-guided tour so that you can take things at your own pace. Besides, there are usually free walking tours at some of these historical sites. For myself, I didn’t have the time to start off at Boston Commons (there are just too many things to do in Massachusetts!). Instead, my journey began at the Boston City Hall, located just in front of Government Center Station. Hmm I don’t really know what to make of it, and from what I understand there’s actually quite a controversy surrounding the design of this building. It’s very huge, intimidating, and supposedly a salute to modernism (what they call ‘brutalist’ architecture) but honestly I think it’s quite ugly o.o We sat Duck Tours (something I highly recommend for an introduction to the major sights of the city) the day before and our driver cheekily told us this building was voted World’s Ugliest Building before. To each his own I guess! Walk to the back of the City Hall and you’ll see Faneuil Hall. Here is the statue of Samuel Adams, a Bostonian who frequently made speeches encouraging independence from Britain in this very place. Behind it is Quincy Market, a popular tourist attraction. It’s packed with tourists all through the day but it’s especially bad in the afternoon. 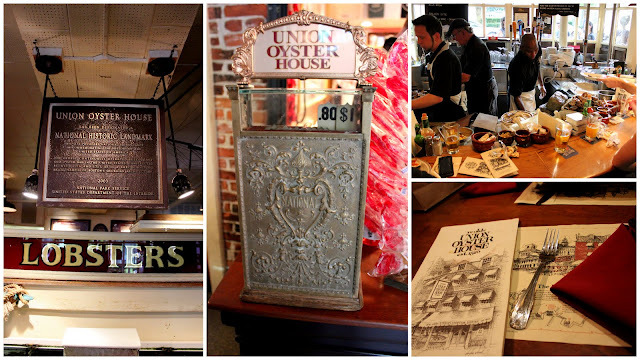 If you are looking for lunch/ dinner place around this area, I highly recommend the Union Oyster House. It’s the oldest restaurant in Boston, and some say America. This place is an institution for New England specialties. It’s along Union Street, a block away from Fenuil Hall. Reservations are a must. 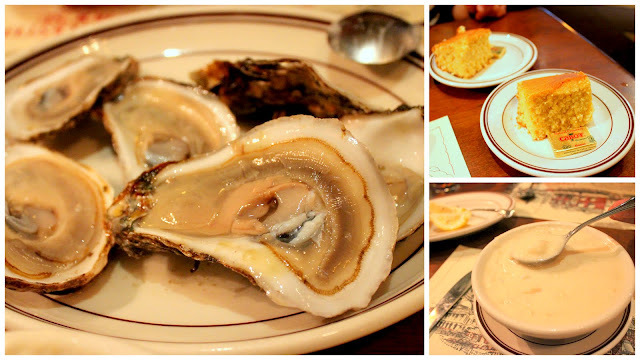 Those oysters were without a doubt, the best I’ve ever had. Cornbread was very more-ish but I only wish it was served hot! The clam chowder is above average but the one by Legal Sea Foods (a chain restaurant in Boston) still tastes better. This version is has a thicker creamier consistency vis-a-vis the the one at Legal Sea Foods which has a thinner consistency and the taste of the clam juice is much stronger. Also, the potato:clam ratio is balanced, you don’t just get potatoes. While I was planning my literary I kept telling myself: try their lobster rolls. But every time I picked up that menu my eyes focus on one section only. Steamed/broiled/boiled live Maine Lobster. This is the smallest size available, 1 1/4lbs. They go by market price and mine was 30.95 USD. Dad got the Large (2lbs) and it cost him 40USD. Usually we eat the Lobster Tail, which tastes delicious and all but my personal favourite are those Lobster Claws. You crack them open on your own so all the crustacean juices are still locked inside. There is a huge chunk of meat in there and it’s more tender than the meat of the Lobster Tail. Delicious stuff! These come with a side of baked potato/fries (recommended)/rice. Behind Union Street is the North End, or Little Italy. I would actually recommend a light lunch here in one of the many independent Italian Restaurants in this area and unwinding in the Union Oyster House at night after your tiring trek along the Freedom Trail. 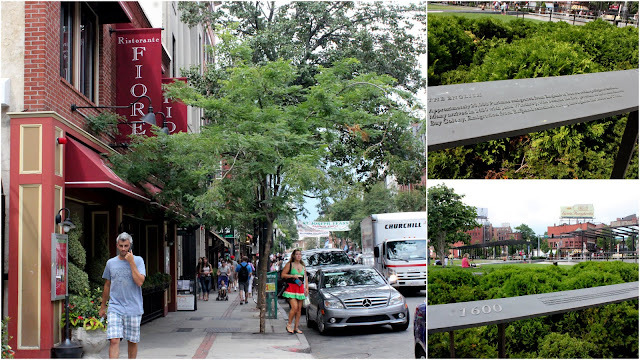 Here you’ll also find one of the sites marked in the map of the Freedom Trail- Paul Revere’s House. I said a “light lunch” because you need to save space for dessert. Mike’s Pastry at 300 Hanover Street (in the North End) is a well known traditional Italian Bakery amongst locals and tourists alike. You may be enticed by all the pastries around you. 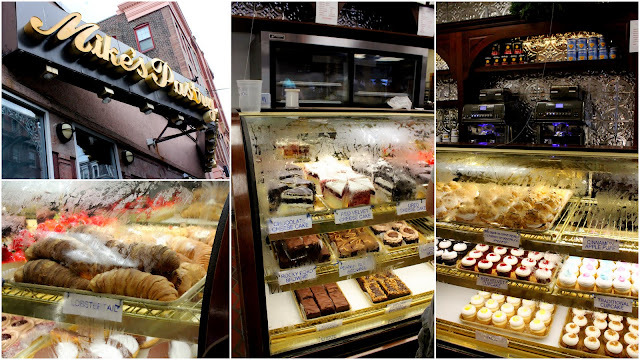 Cupcakes, sliced cakes, tiramisu, lobster tails… they have it all! But what propelled them to fame are their delicious cannolis. 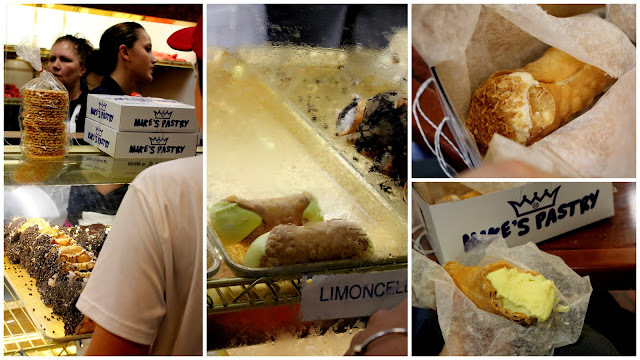 They may seem ginormous at first glance but after a few bites you’ll be convinced that tackling a whole cannoli won’t be so difficult afterall. The cannoli shell is is like a thick pastry shell, not crispy but more of crunchy. The filling was so delicious that I found myself stuffing it in my face- hard not to with a cannoli that size…- despite not being a cream/ cheese fan. Between the two I preferred limoncello because Hazelnut had a curious addition of dessicated coconut at the corners amidst the crushed hazelnuts. The thick filling not too sweet mainly because the ricotta mixed into the cream adds a savoury dimension. Adults will love this. Kids will probably want to opt for their cannoli to be dusted with icing sugar. There are a few small tables at the premises where you can sit and have tea and cannolis. I managed to snag one whilst waiting for the rain to pass 😀 These cannolis should be consumed asap because the ricotta cream filling makes the cannoli shells soggy. Eating them on the spot, chilled out of the fridge would be the best. It’s quite a distance from the North End to the Bunker Hill Monument and the USS Constitution. I took bus 93 (which stops outside Haymarket Station) up towards Charlestown and it stopped right outside the Charlestown Navy Yard (where the USS Constitution is). Used my 18USD 7 day Charliecard which allows unlimited rides for both their subway and bus services. There are lots of things to see within the old navy yard. Understand the history of the USS Constitution inside the USS Constitution museum before heading over to the ship itself. The USS Consitution is one of the first few vessels commissioned for the US Navy. The warship is affectionately known as old ironsides because her thick pine and oak hull famously survived cannonballs during the battle with Guerriere, a British warship. I also followed the free tour (they gather in front of a tent near the USS Cassin Young, look out for a sign with all the timings) up to Bunker Hill. Compared to the USS Constitution, Bunker Hill was less crowded but this stop was one of my favourite parts of the trip. The monument, a giant granite obelisk was built in memory of those who died in the famous battle of bunker hill against the British during the American Recolution. The British only managed to conquer the place after their third attempt, but in the process losing almost a thousand men. Across the road from the monument is the Bunker Hill Musuem which tells the tale of the entire battle at Bunker Hill as well as the work (and money) put in by members of the public just to build this monument. This is all I managed to cover for the Freedom Trail. I tackled everything in bits and pieces instead of the suggested chronological order because I had other things on my schedule. If you can spare the time and energy, I’m sure it’s possible to complete the Freedom Trail in a day.